Angry Birds for Facebook, Coming Soon!!! Angry Birds, the most played game on iOS and Android phones is soon to arrive on Facebook. It means you no longer need an Android or iOS running phone to play Angry Birds. Woohooo!! that’s a great news!!! As per the resources, Rovio Mobile Ltd. is making some improvements in the game before its launch on Facebook and the game should be out soon. As Rovio Mobile Ltd. mentions that Pigs will have some more versatile role to play assures that the game will now be more interesting. Now that Angry Birds is coming to Facebook, Facebook’s traffic is going to increase definitely. 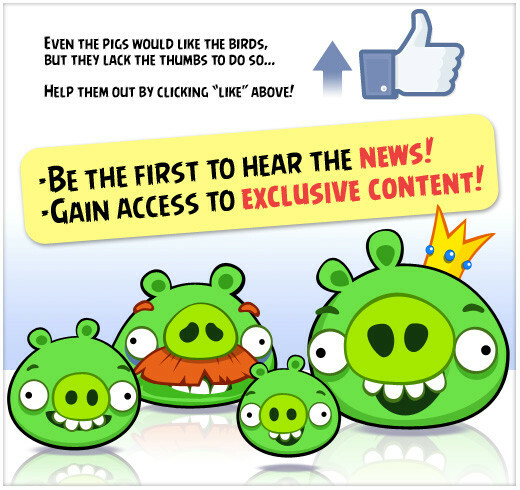 Good move Facebook and Rovio Mobile Ltd.
You can visit http://www.facebook.com/angrybirds and Like the page to get keep yourself updated on the news and gain access to some exclusive content. I will keep publishing about the updates as soon as I get to know about them. If you hear anything about it, do let me know using the Contact Page and if found official, I will post about the same for the other readers. Hope the game comes soon to Facebook and everyone gets a hand on it. The most interesting part to see is how Rovio Mobile Ltd. makes this game more interesting.